Issued just one year after the Great Chicago Fire of 1871. Map of the city of Chicago. 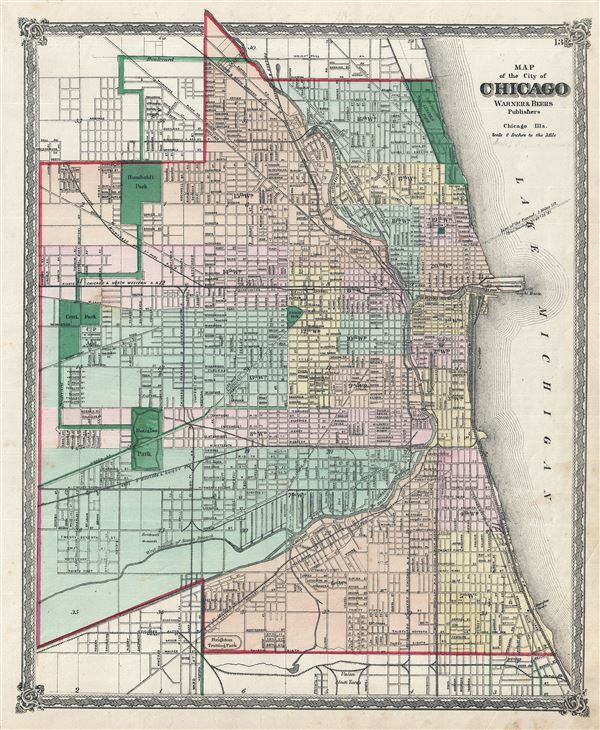 A fine c. 1872 map of Chicago issued by Warner and Beers. The map covers from Fullerton and Wrightwood Avenues to the Union Stockyards and from Central Park to Lake Michigan. All streets, wards, rail lines, public buildings, and parks are identified. The map beautifully illustrates the Chicago Park System. The 'Park System,' designed by Olmstead prodigy William Le Baron Jenny in 1871, refers to a network of parks and garden boulevards intended to embrace the city in arms of foliage. Many of these parks and boulevards remain today. Lincoln Park, Humboldt Park, Central Park, Douglass Park, and the Brighton Trotting Park are all, for example, here noted. This map was issued just one year after the Great Chicago Fire destroyed much of the city. The map shows a prosperous city and shows little of the fires devastation. Warner and Beers issued this map with several of their Illinois many county atlases. It was published in Chicago from the Warner and Beers office at 64 West Lake Street.